So much is going on. It is difficult to keep up with communication lately. Since our last newsletter, we graduated the January Discipleship Training School (DTS), sent the April DTS to outreach at a nearby ex-militant camp, and Cindy and I were asked to lead the July DTS. So instead of joining the April students on outreach, we stayed back to get the July school ready to go. We are also helping to prepare for a program with 1000 youth in a nearby town along with a 10-day program in an ex-militant camp. We recently had another saturday campus sanitation. 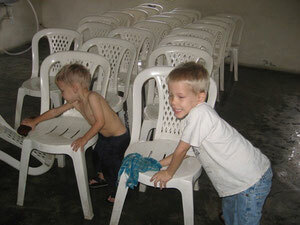 Elijah & Caleb were put to work cleaning chairs in the dining hall. We've been operating the DTS for 5 weeks with 24 students and things are going well. We were excited and honored to lead our first DTS. All 6 of our supporting staff came from the January DTS graduates and they jumped right into staffing. Eric was happy that half of them came from the small-group that he led during their classroom phase of the school. He must have given them a good impression of YWAM. So our staffing experience is limited, but the unity among us is good. We want to thank all of you for praying for our April DTS students. We had some big challenges in that particular school and some of those challenges are still ongoing. And as our attention has shifted from the April school to the July school, we ask that you continue to join us as we pray for those students who are currently on outreach in an ex-militant camp. Cindy is reading to the kids on Caleb's bed. How many kids do you count? Can you find Naomi? For those who have been following YWAM-Port Harcourt, you will know that we have a large focus on reaching out to ex-militants. These are the people who have been rebelling against the Nigerian Government and particularly the government in the Niger Delta Region. Many of them have had years of involvement in the occult. They are responsible for much of the violence and kidnappings in Nigeria. But last year, they were offered amnesty if they come out from the creeks and lay down their arms. Thousands have accepted and joined numerous federal & state programs to be reintegrated into society. They typically spend 6 months in semi-isolated camps where they undergo job-skills training and character rehabilitation. The government has requested YWAM to be heavily involved.